Sometimes even the right ingredients can taste bad when combined improperly. Sadly this concoction of big names in a Xmas themed comedy is as clichéd as getting socks and undies from your auntie. The premise – “Dusty (Mark Wahlberg) and Brad (Will Ferrell) have joined forces to provide their kids with the perfect Christmas. 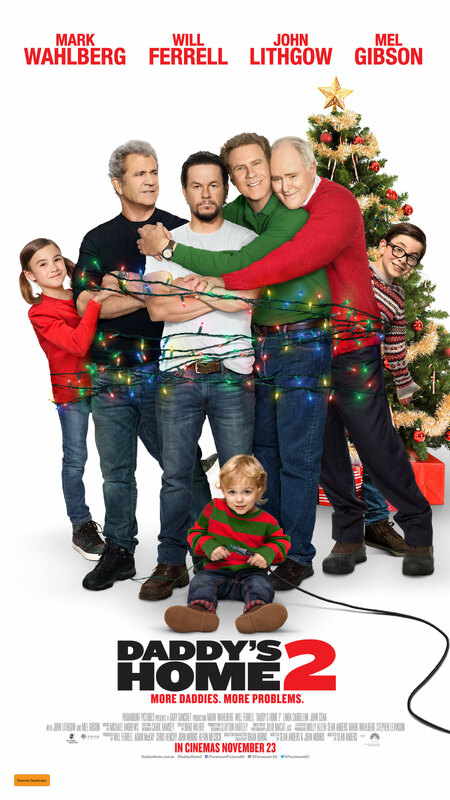 Their newfound partnership is put to the test when Dusty’s old-school, macho Dad (Mel Gibson) and Brad’s ultra-affectionate and emotional Dad (John Lithgow) arrive just in time to throw the holiday into complete chaos.” – should deliver better results than this sorry state of affairs. The end result is a low point for every single actor involved as they work with cringe worthy material that barely gets a laugh except out of pity. A scene where the guys head to an improv club, with one of them getting onstage, only to reveal that this character has experienced a significant personal setback, is one of many low points in this awful film. 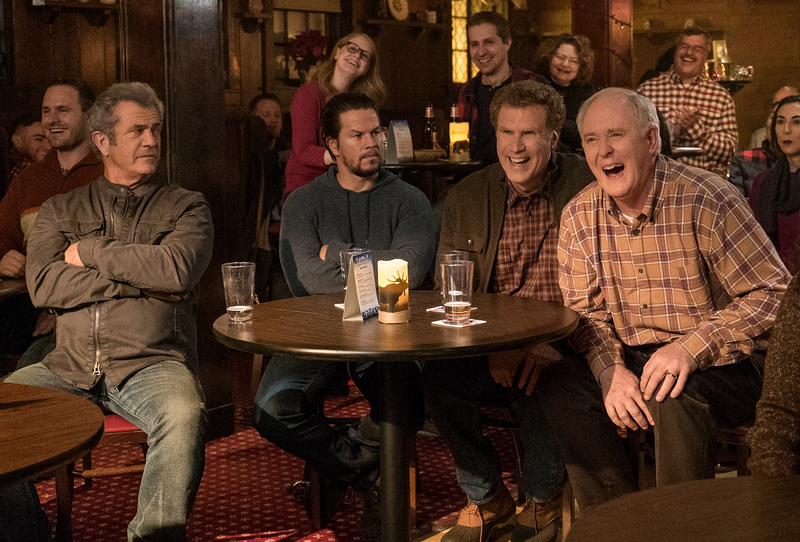 Mel Gibson plays Kurt, Mark Wahlberg plays Dusty, Will Ferrell plays Brad and John Lithgow plays Don in Daddy’s Home 2 from Paramount Pictures. The first film played for around 10 weeks in Australia between Xmas 2015 and February 2016 taking in an impressive $15 million USD ($22 million AUD), placing it just behind Mad Max: Fury Road for films released in 2015 in Australia. Sigh. Judging by the enjoyment I got from Bad Moms 2 (aka A Bad Moms Xmas), intrusive mothers are better fodder for laughter than dads barging in where they are not welcome, but desperately wanted by their sons. How the minds behind Horrible Bosses 2 and We’re The Millers (which were at least funny if not amazing), managed to come up with this turgid film is anyone’s guess, but judging by the dollars it brings in, you’d have to say “If it ain’t broke, don’t fix it”. Mark Wahlberg plays Dusty and Will Ferrell plays Brad in Daddy’s Home 2 from Paramount Pictures. The film’s biggest achievement is to make Mel Gibson look uncomfortable in his role as the ultra-macho Dad of Wahlberg’s Dusty, and Will Ferrell look decidedly unfunny, and this is easily the worst film of his I can remember, and sits in his bottom five on Rotten Tomatoes. There are definitely better films to see this silly season.